If you're still not following me on my IG (why aren't you? 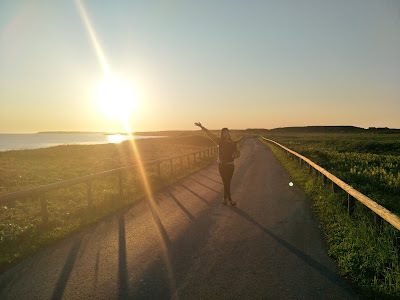 ), then you probably didn't know that I've just returned from an 11-days trip to Hokkaido! It was so so so exciting, starting right from the planning stage. I've been wanting to visit Hokkaido for YEARS, and the plans always fell through because I couldn't find a travel buddy who can commit to the trip. So before I move on to my day-by-day breakdown of trip, let's start with the rough itinerary of the 11 days I've spent in Hokkaido. I chose to fly via Thai Airways, transiting in Bangkok (about 1.5 hrs flight to Bangkok and then 7 hours to Sapporo) and landing in Shin-Chitose Airport, whereby I picked up my rental car from Budget, a Toyota Passo, which the BF really quite enjoyed driving. I've done quite an extensive search and almost got "cheated" by ToCoo! with their "hidden cost" but thankfully realised that Budget offers the most competitive price for the days I'm looking to rent a car. If you're planning to travel through the entire Hokkaido, going for car rental and paired with the Hokkaido Expressway Pass (HEP) might be more cost saving (if you're travelling in minimal of 2 pax) as compared to purchasing the JR pass and relying heavily on Hokkaido's public transport. If you've already decided to go with car rental but still undecided if HEP is for you, here are a few links that may be helpful for you to make a decision. HEP Info: You may find the cost of HEP for 2 days to 14 days, list of participating car rental companies, an example of toll fees from Shin-Chitose Airport to a few common tourists' destinations, and a link to an extensive (but very complicated) Standard Expressway Toll Chart. Toll Calculator: You can use this calculator system to find out exactly how much toll fees you'll be charged by indicating your initial location, final destination, and any additional ICs (areas) you may pass by enroute. The site is only available in Japanese though, but you may find a pretty useful manual HERE. Do note that HEP is NOT the same as ETC. Most car rental sites will tell you that their car comes with ETC, but that simply means their car is installed with the device unit for you to insert the ETC card (like our local cashcard). And as for the difference between ETC and HEP, ETC is pay per usage, while HEP is a flat rate with unlimited usage. For me, getting the HEP is an absolute MUST because of my itinerary, which brings me to areas like (and not limited to) Hakodate, Lake Toya, Sapporo, and Asahikawa. For example, the toll fee for driving from Shin-Chitose Airport to Hakodate will set you back by 5430 Yen (one way) and the drive back to Shin-Chitose Airport from Asahikawa will cost me another 4730 Yen. Driving from Hakodate to Lake Toya needs another 3330 Yen, and them from Lake Toya to Sapporo needs another 3590 Yen and then from Sapporo to Asahikawa will need yet another 3490 Yen. And an 11 days HEP will only set me back by 9800 Yen. I didn't even need to factor in the possible toll charges for the drives to Biei, Furano, Takinoue and Yubetsu from Asahikawa. However, after more in-depth planning and consideration, I decided to not keep the car over the 4 days of my stay in Sapporo due to easy accessibility of most attractions by public transport and much higher parking fees. Eg. 30 minutes parking in Hakodate will cost you about 200 yen, but 30 minutes parking in Sapporo (during "peak hours") will cost you 400 yen! And now, here's my 11 days itinerary, which I will slowly touch on a day-by-day basis in the subsequent Hokkaido travelogue posts to come. And now, for some snippets of what's to come in all my subsequent Hokkaido Travelogue series. So be sure to stick around and also keep a lookout for my post updates on my IG! Wow, those are awesome IG-worthy destinations. It's always a pain when you feel you got cheated with hidden costs especially when traveling. Wow that's a lot of money to pay for parking when you only pay half for car rental, haha! Thanks for sharing about those great places in Hokkaida. Thanks for sharing about those great places in Hokkaido. Hokkaido looks beautiful! I'll definitely put it up to my bucket-list of must-see places in Japan! Thanks for the tip btw. Now I know that it's more cost-efficient to travel via car rental. I only usually travel with the bf, so that's really helpful!